Sempé/Goscinny, French with illustrations, softcover. 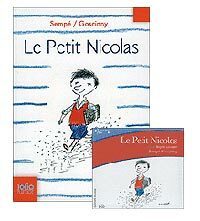 The many adventures of Petit Nicolas and his friends are among the most popular and enjoyable French paperbacks for adults and children. The text and illustrations of Sempe and Goscinny are entertaining additions to the French curriculum. ISBN: 9782070619887 ISBN10: 2070619885. Written by: J Sempe, R Goscinny. Softcover, 148pp..
ISBN: 9782070392612 ISBN10: 2070392619. Written by: Sempé, Goscinny. Text only French with illustrations, softcover. ISBN: 9782070535569 ISBN10: 2070535568. Written by: J Sempe, R Goscinny. Audio CD. Written by: Sempe. 1 cd and 1 book. ISBN: 9782070612772 ISBN10: 2070612775. Written by: Sempe. Softcover, 149pp..
ISBN: 9782070392605 ISBN10: 2070392600. Written by: sempé goscinny. Text only. ISBN: 9782070619900 ISBN10: 2070619907. Written by: J Sempe, R Goscinny. Softcover, 146pp..
ISBN: 9782070577057 ISBN10: 2070577058. Written by: J Sempe, R Goscinny. Softcover, 135pp..
ISBN: 9782070392629 ISBN10: 2070392627. Written by: sempé. Text only. ISBN: 9782070577026 ISBN10: 2070577023. Written by: J Sempe, R Goscinny. Softcover, 151pp..